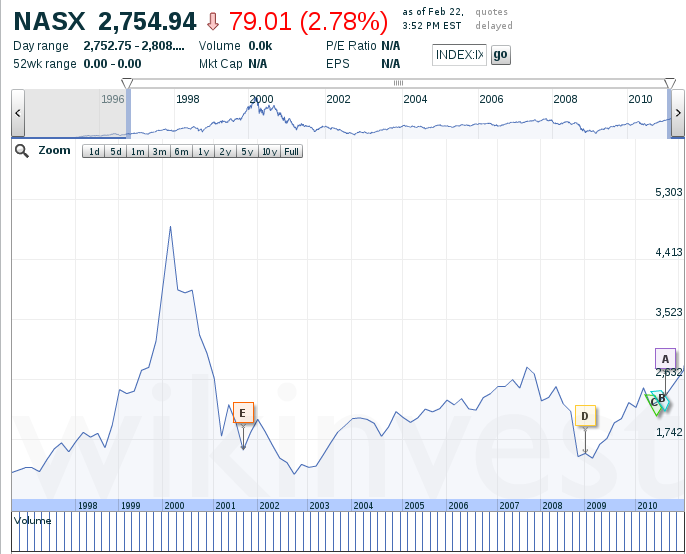 Quiz question No1: When has NASDAQ reached its peak? Quiz question No2: When will be the next peak moment? The answer: Hmm, it looks as if sooner than we expect? 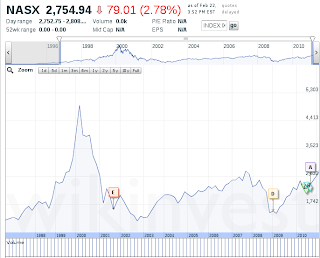 I still remember, or, I still 'hear' the last dot-com bubble explosion. It was so unusual to read in the newspapers about Internet companies disappearing every day. One year before that I was a freshly-baked student, and I felt that this is the moment to start new life as an IT specialist. I had a dream. I felt that each new dot-com company can appear on the Internet as a rainbow after the rain and start a new challenging e-business. Sadly that rainbow disappeared as quickly as it appeared, the same was true for many companies as well. At that time I was a PL/SQL programmer who had one-year experience and was working for Clinika.pl (BTW: now I see that its WWW address is still active but the content is really different from that in year 2000) and Internet had 'only' 400 million unique users (now Facebook brags about 600 million). 5. LinkedIn's plan to go public this year ushers in a new era of Internet and social media companies floating on the stock market. 6. E-* company Reached $x Billion Valuation. 9. Dot-Com Bubble Exploded Again? 10. Have we learned our lesson? 11. Will we learn our lesson? It may seem a little bit strange but we are probably in a boom phase again. The success of social media (Facebook in particular) and more recently social commerce (Groupon) has reminded people of how quickly large, profitable, valuable franchises can be built. As a result, there is once again a rush to invest. This will probably lead to many disappointments and the 'rainbow' will again disappear as fast as an decade ago. OK, now it is a little bit different than a decade ago. The companies have the real business models, significant revenues, valuations are growing up and up, etc. Maybe I'm too much pessimistic, but in my private opinion, that 'young bubble' finds the investors from the 'e-new school' hoping that a rainbow will be shining more than one short 'e-day' this time. 'Find a new promising dot-com business and invest as fast as possible' :) .